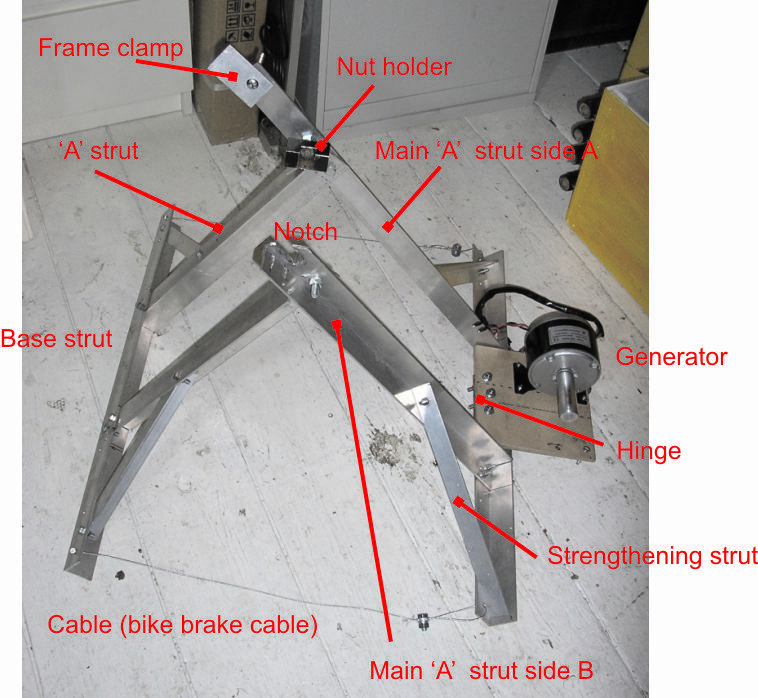 Here are full constructional plans for a do-it-yourself pedal generator, including the bicycle stand. This is designed so that there is no welding involved (as I do not have welding equipment). I have built two of these stands and they have proven to be quite reliable and robust. An amazing book for human powered devices, which includes a pedal generator plan, is ‘The Human Powered Home’ by Tamara Dean and published by NSP. 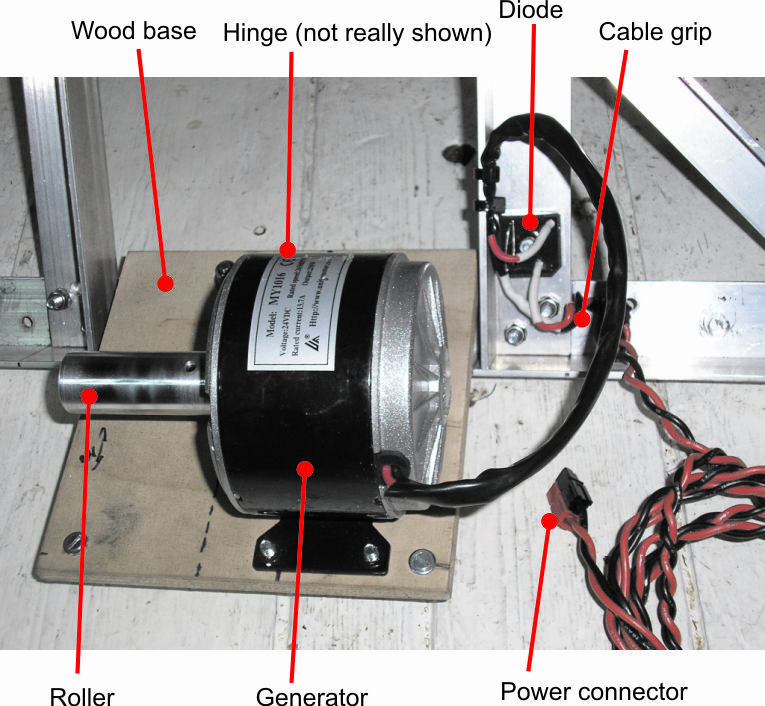 This DIY guide explains one pedal generator design, based upon the Magnificent Revolution design and using a permanent magnet generator. The main concept was to find a relatively cheap design which does not require any welding and can be built with commonly available parts and tools. It is mainly built from relatively thick angle-section aluminium which is bolted together. 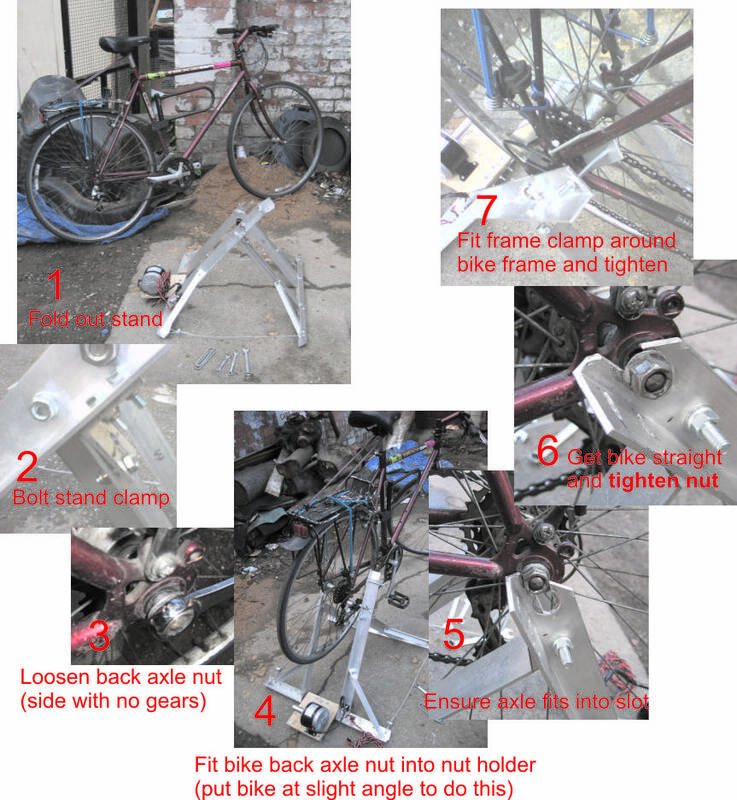 This guide has been broken into two sections: the bike stand and the generator and electricals. The bike stand can be used for other designs such as a pedal powered smoothie maker…. The stand might not fit all bicycle frames, but it has worked on all the typical mountain and racer style bikes that I have used so far. DISCLAIMER: These instructions are given as a guide for the competent pedal power enthusiast. The authors do not take any responsibility for damaged tools or any injury which may occur. Please stay safe when using power tools and do not experiment with electricity unless you are sure you know what you are doing. Consult a qualified person if you are unsure at any stage. 30mm x 30mm x 3mm (thick) L section angle aluminium (1¼” x 1¼” x 1/8”) – Use a thick grade (3mm or better). Steel could also be used (and is generally easier to find for free), but we had aluminium available and it is lightweight for carrying to events. (Try www.aluminiumwarehouse.co.uk). 25mm x 25mm (1” X 1”) box section steel – This is commonly used as old school table frames. Only a small length (50mm) is required. 6, 8 and 10mm nuts and bolts and spring washers – The main structure is held together with these. Stainless steel nuts and bolts along with locknuts, which should ensure they stay corrosion free and the bolts stay tight even with long-term vibration. Bike brake cables – These must be the thick ‘brake’ type cable (or use a number of gear cables to share the load) as it will be under quite a lot of strain. These do not need to be full length, so old broken ones can be used, as long as they have around 1m of useable cable. Plywood – Approx 150mm x 150mm and around 10mm thick. Roller – This can be made from aluminium –or from different things e.g. a roller-skate wheel. 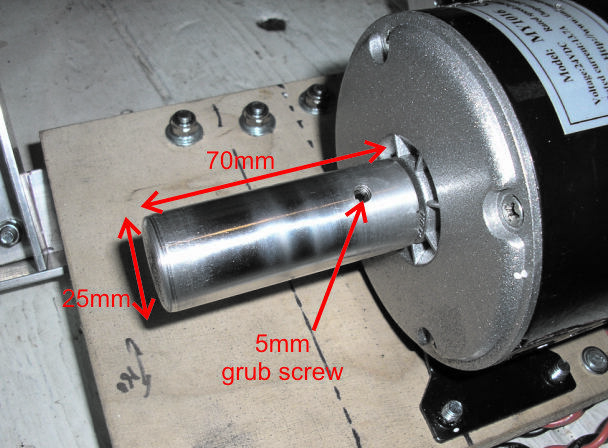 A permanent magnet generator – Type MY1016 available from eBay. This is a 24V motor designed for use in an electric scooter. We will be rotating it so it will work as a generator. These are available from eBay at a cost of around £30-40 delivered. Diode – This must be rated for more than 20A and at 50V DC or higher. Electrical cable – Quite high currents can flow so use decent, thick (2.5mm2 as a minimum) multi-stranded (flexible) copper cable as the main power cables. A bike – Any type will do. Best if it has slick tyres as the knobbles add to noise and heat. I use a low cross bar (woman’s) mountain bike with a road slick back tyre. This allows people to easily get on and off the generator. Access to metal lathe (ask around and find a friend) – to manufacture roller. When you have all the parts and tools this generator should take around 1 day to build. But it’s not a race. The first part to build is the stand onto which the bike sits. This must keep the back wheel off the ground and be robust and solid. Remember people are getting on and off the generator so it must be quite wide to ensure the bike does not tip over and it must be able to take the abuse of many people trying to out-pedal each other. I am relatively happy with the aluminium design but think that a steel version would be more durable. Two of these ‘A’ frames are then used (one for each side of the bike). These are joined at the base to widen the stand to provide stability. Firstly measure and cut aluminium (or other metal) angle sections. * Note: The strengthening strut could also be made from smaller L section to keep cost and weight down. I used 20 x 20mm. Also the strengthening struts should be cut at 45 degrees on each end, as they will be inserted at a 45 degree angle. Cut away sides from one end of the two 450mm ‘A’ strut pieces. These are bolted to the main ‘A’ struts (one to side A and one to side B). The section cut away must be the same width as the size of the angle aluminium used (in this case 30mm). This allows the two ‘A’ frame pieces to fit together at an angle of around 90 degree. Cut away sections from opposing sides of each ‘A’ strut piece. In the end of the 500mm ‘Main ‘A’ strut side B’ drill a 10mm hole in the middle of the strut, around 30mm down from one end. Cut from the top of the strut down to the edge of the hole on each side using a hacksaw, to make a slot and then file any sharp edges. This is for the back bike axle to sit in. The nut on the back axle will be loosened at this point to fit into the slot and then tightened up to hold onto this slot. Also drill a 10mm hole in the same place on the 650mm ‘Main ‘A’ strut side A’. This will be used to hold the box section nut holder on the other side of the back bike axle. Cut the end of the 500mm strut across at an angle of around 30 degrees. This is because the bike frame (when attached) will hit into this piece of metal if it is not removed. 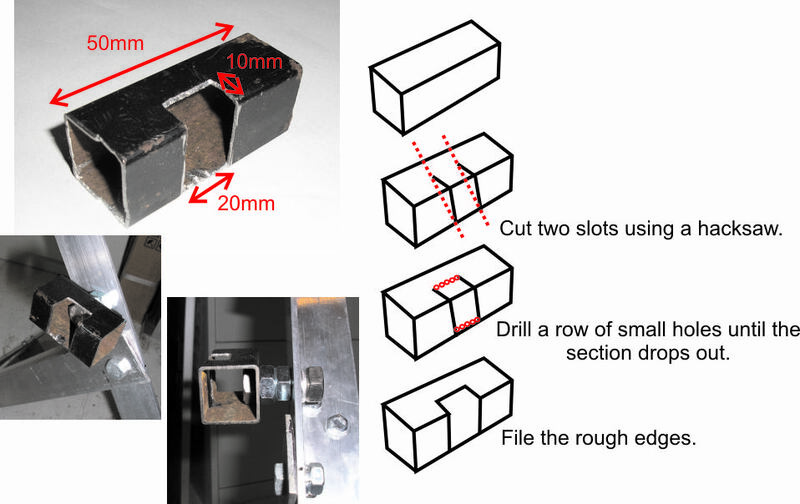 Cut a small length of box section steel (50mm). This will make a holder for bike nut for the opposite end of the back bike axle. In the middle of this cut away two sides of the box section to make a hole around 20mm wide. Follow the diagram to see the exact dimensions of the hole. This can be made by cutting at an angle with a hack saw. 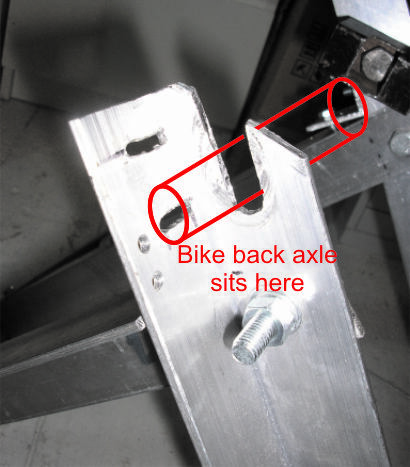 The box section is held onto the bike stand using a 10mm bolt. This should be around 40mm long. Drill a 10mm hole in the back of the piece of box section (see photo). As can be seen, two nuts are used to space out the box section so that the gears and gear shifter on the rear wheel can be accommodated. The two ‘A’ frames can now be constructed. Get hold of the 600mm Main ‘A’ strut side A and one of the 450mm ‘A’ struts. Do they fit together correctly? The two angle sections will fold together so that one section fits into the other section. If not, then get the other 450mm ‘A’ strut, which should work (you have cut away opposing sides on the two 450mm ‘A’ struts). Fit the two sections together, ensuring that the bases are at the same level. Clamp to hold them. Drill an 8mm hole at the top of the 450mm strut, through both pieces. This should be around 20mm from the top and in the middle of the angle section. Repeat this for the other ‘A’ frame (side B). Ensure that the 8mm holes are at the same position as the other ‘A’ frame (or else it will not open and close very easily). 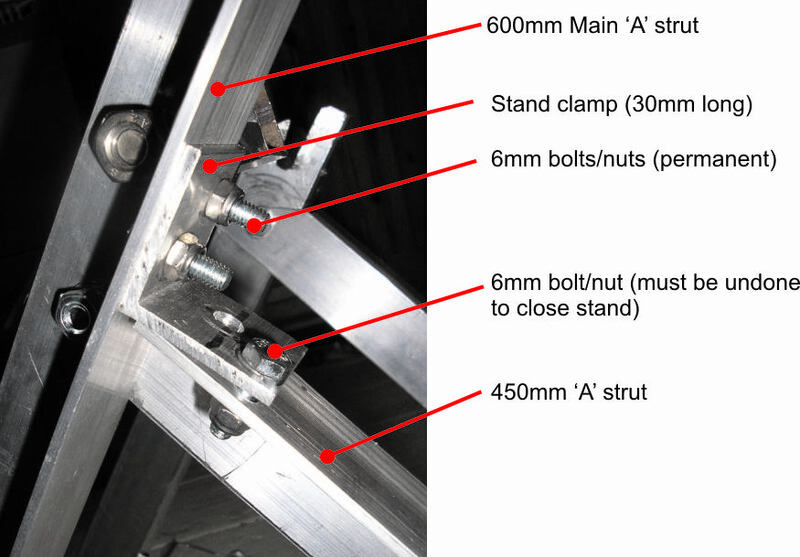 Bolt together the 600mm Main ‘A’ strut side A with the appropriate 450mm ‘A’ strut using an 8mm bolt. Use spring washers to ensure these will not become loose. 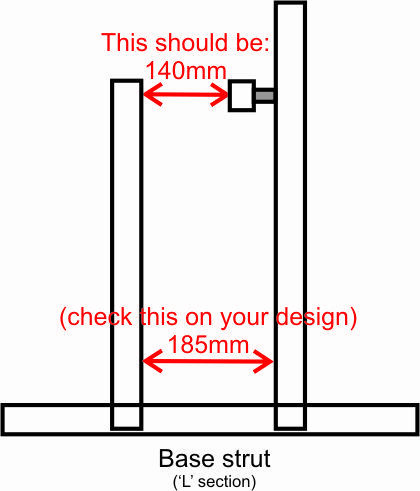 Do the same with the 500mm Main ‘A’ strut side B with the appropriate 450mm ‘A’ strut. The two ‘A’ frames are then bolted onto the bases. The width will be dependent upon the bike used. I have measured a few bikes and the back frame width is typically between 120mm and 140mm. I used 140mm as the bike width. The bike frame clamp ensures that variations in bike frame width can be accommodated. The distance from the box section on one frame to the slot on the other frame should be 140mm. Measure this plus the width of the two nuts on the bolt holding the box section. This will be the width at the base for the two ‘A’ frames. On my design this is 185mm. 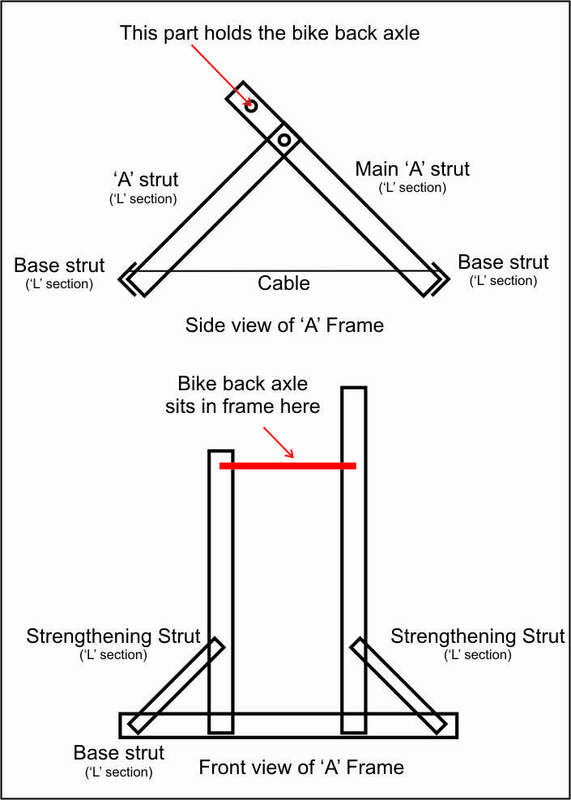 Ensure the frames are straight and clamped. Drill two 6mm holes and bolt using lock nuts to ensure they do not become loose with vibration. Do this on both sides of both ‘A’ frames. Now add the strengthening struts. These fit between the base strut and the ‘A’ frame struts on the outer side. Place the strengthening strut at an angle of 45 degrees. Clamp this and drill through with a 6mm hole. Use 6mm bolts, again with lock-nuts. 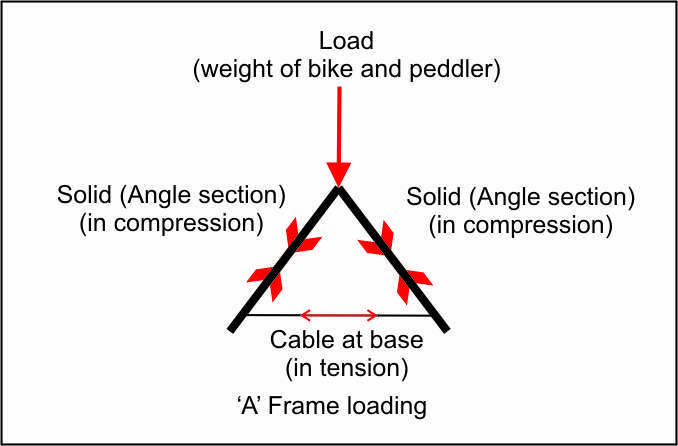 Two brake cables are used to ensure that the ‘A’ frame does not collapse when loaded with bike and rider. These fit through holes in the base struts. The cables are looped through the base struts and clamped to hold the cable. I used a 4mm hole in each base strut, around 50mm in from each end of the base strut. More cables would probably be better (perhaps if using thinner gear cables). To clamp the cables I used home-made cable clamps. Use an 8mm bolt (only needs to be 15mm or so long. Drill a hole at the base of the shaft of the bolt (I used a 3.5mm hole, but start with a smaller hole and expand it out). Drilling a hole through the 8mm bolt is difficult to start as it is a round surface and the drill bit slips off. 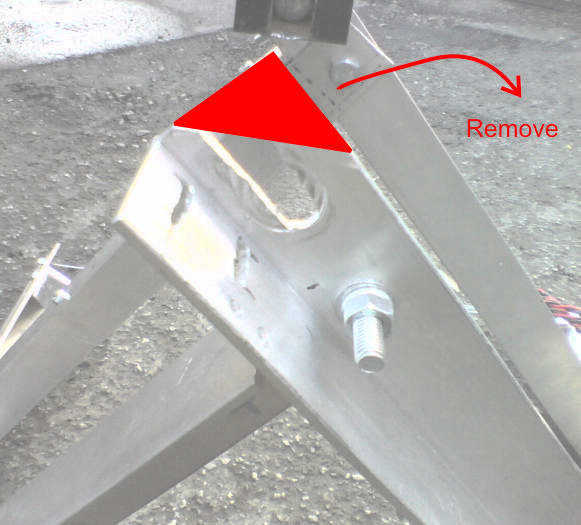 To stop this you can file one side of the bolt flat using a metal file to give a flat surface, then drill. You could also use a punch to give an indentation for the drill bit to stay in. Place a washer onto the bolt. Then the cable is then passed through this hole, through the base strut and back through the hole. 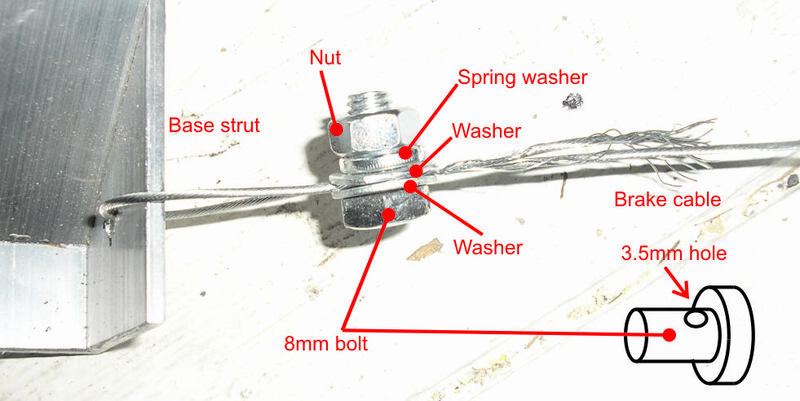 A washer is placed onto the bolt, then a spring washer, then a nut. Tighten the nut to clamp the cable. Be slightly careful with this as I have snapped the cable when clamping it. 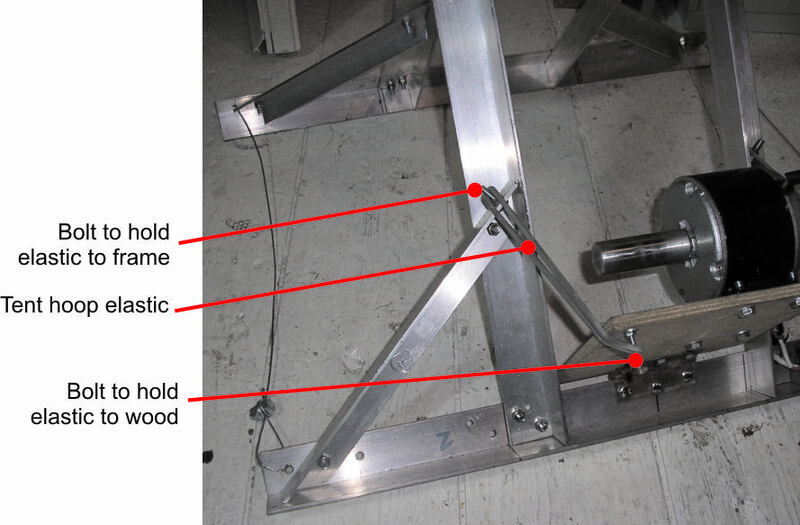 An additional stand clamp is also used to ensure that the frame is rigid. This is probably optional but made the frame feel much more robust when added. The stand clamp is a small section of angle section (30mm long) which is bolted to the 600mm main ‘A’ frame strut side A. This holds that strut to the other ‘A’ frame strut when the stand is folded out. It must be undone to fold up the stand. Now for the frame clamp: This is a piece of angle aluminium which fits around the bike frame and bolts to the bike stand to hold the frame to the stand and ensure that the bike back axle nut does not jump out of the nut holder. This might need some adjustment depending upon different bikes used. 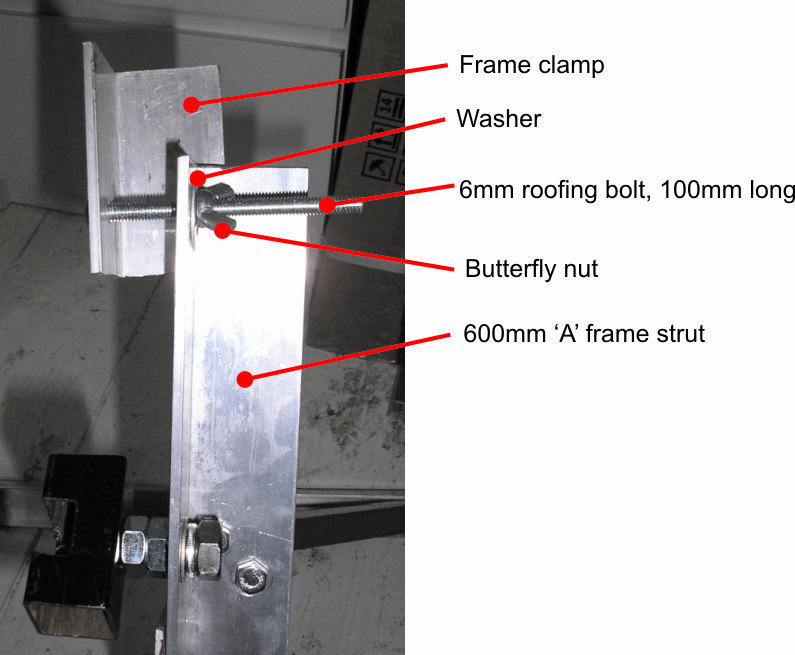 A long (100mm) 6mm roofing bolt is used to hold the frame clamp to the stand. Hence a 6mm hole must be drilled into the frame clamp and into the top of the 600mm main ‘A’ frame strut side A. The roofing bolt holds them together. A butterfly nut is used so that this can be tightened up ‘in the field’. To fit a bike onto stand you will need a 15mm spanner and two 10mm spanners. Firstly open out the bike stand (1). 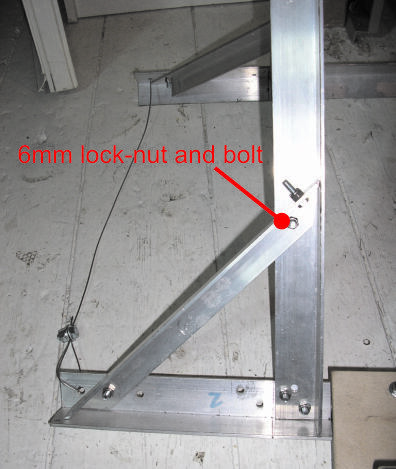 Fit in the 6mm bolt and nut which holds the stand clamp (2). Tighten this to make the stand rigid. Loosen the bike back axle 15mm nut on the side without the gears (3). Lower the bike into the stand so that the nut on the gear side fits into the nut holder box section (4). This is best done at a slight angle and then twist the bike around, but find your own technique. The other side of the back axle should fit into the slot you have made. The nut should be on the outside of this slot (5). When the bike is fitted into the stand, get it straight and tighten up the nut (6). The first time the stand is used you might need to file the slot to ensure that the bike stands straight and feels level. Ensure that the nut is fully tightened so that the bike feels solid and firm. Next fit the frame clamp (7) onto the back bike frame. Tighten the butterfly nut to hold the bike into the frame. Check that the nut will not fall out of the nut holder. Check the bike feels solid by putting weight onto it. CAUTION: When taking the bike off the stand always remember to re-tighten the back axle nut – you do not want the rear wheel falling off when cycling home from your pedal powered event. 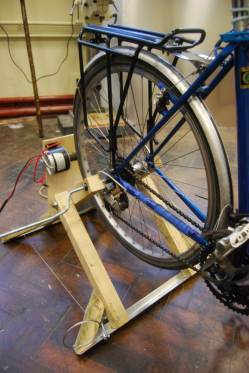 Now we have a robust stand to hold the bike and allow the bike wheel to spin. Next we want get some power from the spinning wheel. The basic idea is to have the back tyre turn a roller which is connected to a generator. We are trying to have a relatively high rotational speed (to give us a reasonable high voltage (around 12 to 24V DC), hence we have a large wheel turning a small roller. Building the roller: This is probably the hardest part to do without specialist equipment. It is best to have access to a metal lathe and someone who knows how to use it. Ask around friends and family. Get in touch if you need a roller made and maybe I can get some made up. Lathe a piece of aluminium into a 25mm diameter x 70mm length roller. Drill a hole into the end of the roller (8.2mm diameter and 20mm deep). Drill and tap a 5mm hole to hold the roller onto the generator. Also check out the Magnificent Revolution plans as they have technical drawings for a roller design. Cut the piece of plywood to the correct size to be able to fit into the gap in the frame. In the case it was around 150mm x 150mm. Drill holes for the hinge and for the generator. The generator has tapped holes for 6mm bolts. 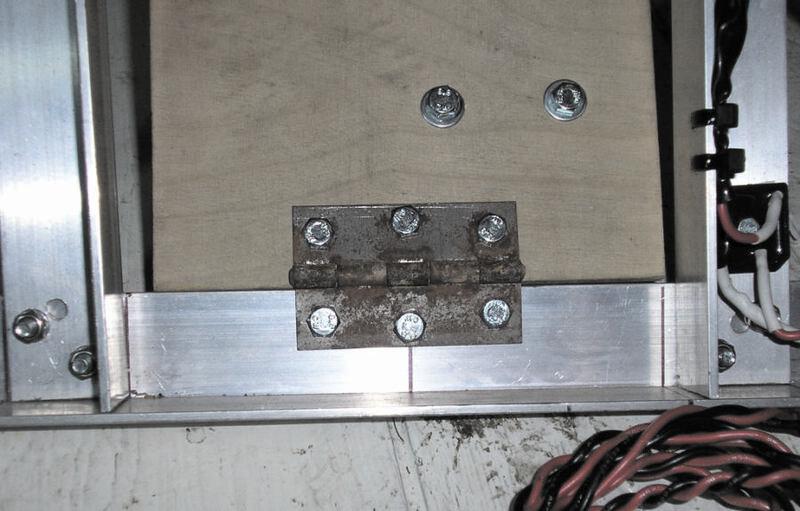 6mm bolts were also used for the hinge. The roller must be pushed onto the back bike wheel with enough grip to ensure the generator turns. To do this some form of elastic is used to hold the generator onto the wheel. Tent hoop elastic was used in this case, but bungee cords could also be used and might be more durable. The elastic must clip onto something. In this design additional bolts are added onto which the elastic is clipped. This required two bolts on the stand and two bolts on the piece of wood. Do this on both sides of the generator. A diode stops the generator working as a motor if connected to a battery. 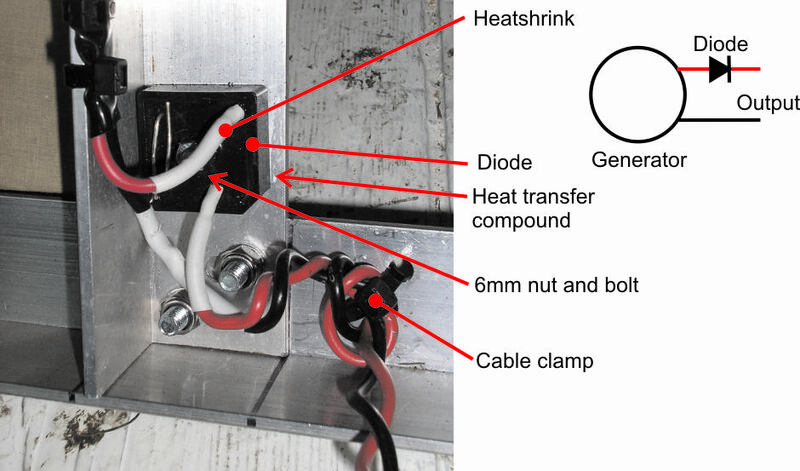 The diode must be rated to handle the maximum current and voltage from the generator. This is approximately 20A at a maximum of 40V DC. We are trying to generate 12V. 20A at 12V equates to around 240W, a typical reasonable cyclist can keep up a rate of around 50 to 100W, so this should cover most situations. Many diodes will work. Check the data sheet to ensure it is rated for a constant current of 20A or more. I have used a 25A rated bridge rectifier, as I had this available. In this case connect the generator +ve output to the AC connection on the rectifier and the output +ve wire to the +ve connection on the bridge rectifier. The diode will have a small voltage drop and so, when current is flowing, there will be some power loss in this component (power = volts x amps). This must be removed or the diode will get too hot. Some form of heatsink is required. As the frame is metal, I have used the frame as a large heatsink, with the diode bolted to the frame, along with some heat transfer compound. This should stop the diode ever getting too hot even with high currents flowing for a long time. A fuse might also be included in the output lead, especially if a battery is used. A 20A blade type (car) fuse would work fine. Either use spade connectors to connect the cables to the diode (if that is the form of connection) or solder the cables to the diode legs and use heat-shrink over the connection (as was done on the bike generator shown here). The legs of the diode are very fragile, so make sure that they are protected well. The output at this stage is unregulated and will vary with the rotational speed of the generator (i.e. dependent upon the rider turning the pedals, the gearing of the bike and the size of the roller). Some form of regulation circuit is required to ensure that the voltage does not go so high that it will damage any connected equipment. Circuits for regulating the voltage will be dealt with in another guide. Check www.re-innovation.co.uk for updates. Have fun with it and think of new and better ways of doing things. Please get in touch with any ideas and designs so this guide can be updated. Here are some images and ideas from other people who have used these plans (or parts and ideas from the plans) to make their own. There are some great ideas for improvements coming in. This design is from Robin Lovelace. This stand uses wood (2″ x 2″?) for the main uprights (lower embodied energy) and then angle aluminium for the base. Its got an interesting adjustable handle for the nut-holder made from bent threaded rod, I think.